Bright young men, hungry for success, such was the order proceedings as play commenced in the Men’s Singles event at the 2018 ITTF Challenge Belgosstrakh Belarus Open in Minsk on late afternoon of Thursday 15th November. Japan’s Shunsuke Togami and Yuta Tanaka, alongside Sweden’s Elias Ranefur and India’s Manav Vikash Thakkar, all upset the seeding. 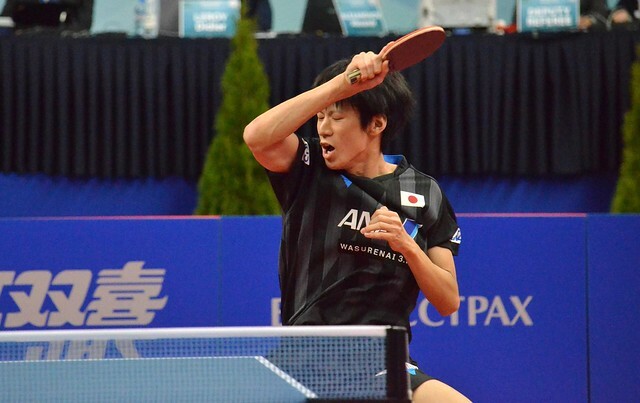 Shunsuke Togami and Elias Ranefur very much set the standard; the winner just under one month ago in De Haan at the 2018 ITTF Challenge Belgium Open when he had retained his Under 21 Men’s Singles title, Shunsuke Togami, 17 years old, replicated the form displayed on the Flanders coast. He beat Russia’s Sadi Ismailov, the no.25 seed, in five games (11-8, 12-10, 13-15, 11-9, 11-6). Similarly, Elias Ranefur, 22 years of age, present at the Nanjing 2014 Youth Olympic Games, excelled; he accounted Scotland’s more experienced 34 year old Gavin Rumgay, the no.18 seed and semi-finalist earlier this year in Nigeria. Similarly, he won in five games (11-8, 9-11, 11-4, 11-8, 11-4). The standard set, Manav Vikash Thakkar, 18 years old, ended the hopes of Japan’s Kohei Sambe, the no.30 seed (6-11, 11-7, 11-9, 11-9, 9-11, 12-10), the player who in 2014 had won the Men’s Singles title on the ITTF World Tour in Chile when only 16 years old, the contest finishing soon after Yuta Tanaka had dazzled. Three days short of his 18th birthday, he never gave Egypt’s Ahmed Ali Saleh, one day after his 39th birthday, time to blow out the candles on the cake. Against the twice winner of both the African Cup and the Men’s Singles event at the African Championships, Yuta Tanaka prevailed in straight games (11-3, 11-4, 11-6, 11-3). Four quite blistering performances; it was very much the same from the leading names in action as matters commenced. Ukraine’s Kou Lei, the top seed, beat Poland’s 15 year old Maciej Kubik; Belgium’s Robin Devos, the no.8 seed, overcame Andrii Grebeniuk, like Kou Lei from Ukraine (11-3, 11-5, 11-3, 12-10). Both Maciej Kubik and Andrii Grebeniuk had been required to compete in the preceding qualification tournament.